The general explanation of the meaning of the term Mahamudra is easy to understand but very difficult to realize, because it is the essence of all Dharmas. An analysis of the four syllables of the Tibetan translation, which is phyag-rgyä-chen-po, shows that each syllable has a specific meaning. The first syllable phyag refers to the fact that all things are empty of inherent existence, in particular, it refers to the emptiness called “emptiness which possesses all supreme aspects” or “the supreme among all aspects.” The second syllable rgyä means “nothing passes beyond this state of emptiness” or “there is no passing beyond it.” The emptiness presented in the first syllable is not the affirmation of a non-affirming negation, rather it is an emptiness that is at the same time luminous – it possesses the characteristics of inseparable emptiness and clarity. So the second syllable indicates the aspect of lucidity and compassion. The second set of syllables in phyag-rgyä-chen-po is chen-po and literally means “great.” It points to the fact that the two aspects of phyag-rgyä – emptiness and clarity – are indivisible and are therefore great. Whether this is described as the integration of compassion and emptiness or as the integration of lucidity or clarity and emptiness, in any case, it is the ultimate essence of the Buddhadharma. Furthermore, Mahamudra is the ultimate abiding nature of all things within samsara, “conditioned existence necessarily entailing suffering,” and nirvana, “peace free of conditionality.” Therefore, when such a meaning is taught, it is necessary to listen to the teachings with the completely pure intention that by hearing such an explanation of Mahamudra, all beings will be benefited. It can be said that there are two ways in which Mahamudra may be presented. The first is the introduction of the actual meaning of Mahamudra by the Lama to a student. The second is the study of authoritative texts of the Mahamudra tradition, which elaborate the general meaning. The first is a direct introduction or pointing-out of the ultimate wisdom of Mahamudra to a disciple. Yet, before being able to correctly identify the essence being introduced by the Lama, the student has to be a fitting receptacle, which means he or she must have undergone the extensive preliminary practices, which are commonly given as the basis for Mahamudra practice. Furthermore, the connection of the Samaya, “bond,” between the Lama and student must be firm. And the student must undergo the practices of calm abiding and special insight meditation. As expressed, the first knowledge that arises when a practitioner of Lord Buddha’s teachings treads the journey to enlightenment is the knowledge won from hearing the teachings. By means of hearing the instructions, one becomes free of the obscuration of ignorance. The second knowledge that arises is the knowledge won from contemplating what one has heard. The Third Karmapa tells us that it is through contemplation that one dispels the darkness of doubt. The third knowledge that is won by practicing the path is the knowledge attained by practicing meditation on the basis of having contemplated what one has heard. The knowledge that arises through meditation practice illuminates the abiding nature at fruition. One needs all three kinds of knowledge in order to practice the Buddhadharma correctly. If one hears the teachings, doesn’t contemplate and meditate them, then simply hearing the words of the Buddha will not enable one to realize the meaning, which is realization of one’s Buddha nature. Is it possible to realize Mahamudra simply through learning it, simply through studying it, simply through an intellectual understanding without meditation? The answer is, no. A follower of Buddhism can never realize the ultimate nature through a mere intellectual understanding. Even those disciples with the most acute faculties, even those with the best of the best openness for the Mahamudra Tradition, even those who have practiced it in previous lifetimes and are therefore very open, and even those persons who would achieve instantaneous liberation and recognition upon receiving the direct identification or transmission of Mahamudra need to receive the Lineage Blessing. Since this is the case for advanced practitioners, then it is all the more so for less advanced practitioners. The genuine transmission of Mahamudra has to be a transmission of what is called dön-kyi-ye-shes, “wisdom of the meaning.” It has to be and is more than mere words since it goes beyond words. The blessing of the transmission is not something that can be grasped or transmitted through reasoning or books. The transmission lineage of the special instructions is an unbroken lineage of the continuity of the blessings. The transmission is the inspiration of realization that has been passed down through the continuity of the teachers and disciples. It is on the basis of a disciple’s extraordinary faith and devotion for his or her teacher that he or she is able to receive the ultimate lineage of transmission. The transmission of Mahamudra has to occur on the basis of the simultaneous presence of the words and meaning through the Lama’s blessing and the disciple’s devotion. Again, the transmission is not something that can be realized simply through an understanding, or words, or merely through hearing the teachings. Once the correct and actual transmission of the wisdom of Mahamudra has occurred, it is then necessary for the disciple who has received the transmission to meditate the meaning. Therefore, a disciple first receives the Mahamudra instructions from the Lama, contemplates them, and then meditates upon them. Some people think that meditation is so decisive that it is not necessary to hear and then contemplate the instructions. This is not correct, because without having received the oral transmission, without having heard and contemplated the teachings of Mahamudra, one would not know what to meditate and that realization is realization of the abiding nature. There are people who think that only resting their mind in a state of blankness with closed eyes is meditation. This is not so. Mental dullness is not Mahamudra and has nothing to do with the realization of emptiness. Persisting on a mental state of dullness is called by its name, “the cultivation of ignorance.” What one really needs is to progressively develop the three knowledges that arise from hearing, contemplating, and meditating the instructions. Based upon the three knowledges, one then continues and engages in the correct view, meditation, and conduct of Mahamudra. There are two examples to illustrate the errors that arise if one does not follow this sequence. First, it is said that attempting to practice the teachings without having heard them is like trying to climb a cliff without hands. Secondly, having heard the teachings, received the transmission, and not meditating upon them is like returning empty-handed from an island filled with jewels, in other words, returning without having benefited at all. To actually bring the practice to fruition, one must practice by integrating the ground, the path, and fruition in one’s life. The term “ground” in this context refers to the view, which is the correct identification of the ground. It is necessary to practice Mahamudra within the understanding of the ground, path, and fruition. The ground, i.e., the base, is the abiding nature. The abiding nature must first be understood correctly. Following, the path is explained and revealed and is then to be understood without misconceptions. The purpose of knowing the ground is to correctly understand the two truths and to acquire knowledge that is beyond the extremes of realism and nihilism. The purpose of knowing the path is to be able to integrate the two accumulations correctly. Fruition is the accomplishment of the two aims and is the realization that all things are beyond the extremes of existence and peace. One aspires to meet such a Dharma, which is without any mistakes or errors in its explanation. The ground or base of the view is first to be understood as the actual abiding nature of the three realms of samsara and nirvana. Specifically, one needs to know why one is confused, why one is in samsara. One becomes confused because one does not recognize the ultimate nature and consequently falls into one of the two extreme views or misunderstandings – either the belief in permanence or the belief in termination, also translated as “eternalism” and “nihilism.” Delusiveness or confusion that misleads one to adopt one of these two extreme views is based on the failure to recognize the way things really are. On a conventional level or in the context of conventional reality, all things one experiences appear in dependence upon other things, i.e., things are only present relative to the presence of other things. Nothing is present in isolation and nothing exists inherently, because everything is an aggregation of many parts. All composites are only present and can only be present in dependence upon other things and therefore do not exist as inherent entities. When experiencing phenomena, one fails to recognize that all things are present due to dependence; one thinks all perceived objects are inherent existents or real things that exist of their own accord. The adoption of this erroneous notion is called “the belief in permanence.” In actual fact, no aspect of conventional reality exists inherently or independently. The ultimate truth or reality of all things is that everything lacks inherent existence. Failing to recognize the true nature or ultimate reality, one falls into an extreme view and denies that things exists at all. So, one fails to recognize that the ultimate truth is simply the ultimate reality of conventional reality and that these two realities are simply aspects of the same thing, are simply aspects of the interdependence of what one experiences. The correct understanding of the ground is knowing that these two aspects (conventional reality or the presence of things through dependence and ultimate reality or the fact that things are only present in dependence and nothing other or more than that) are the same. Knowing this is knowing the ground. In short, the integration of the two realities or two truths is the ground, i.e., the view. It is important to understand that people often believe that Buddhist explanations make a distinction between what is called “the way things appear,” which is conventional reality, and “the way things are,” which is the ultimate reality that one can experience with perfect wisdom. Since this distinction is made, they think it is therefore necessary to block or bring to cessation the appearance of things and to somehow establish or create an experience of emptiness separate from and beyond appearances. In other words, many people believe that conventional reality is a mistake, that ultimate reality is not a mistake and therefore should be acquired. This, in fact, is not true as to the actual manner of the abiding of things. Such thoughts are a mentally fabricated position. In that case, the distinction between conventional and ultimate reality is simply a mental construct. It cannot be said that conventional reality is a mistake and ultimate reality is not. All things one experiences and defines as conventional realities appear and at the same time are empty of independent existence. All phenomena appear because they are not established in their own essence. Not being established as an independent phenomenon, they are free to appear in the multiplicity of appearances in which they do. Being free to appear in the multiplicity in which they do, phenomena are empty for the one reason that they are not established in their own essence. Both truths are saying the same thing from what is intellectually understood as a different point. In the teachings, this is just distinguished for the benefit of understanding, while the two truths are, in fact, not separate. If one understands this incorrectly and thinks it is necessary to block or bring to cessation appearances that one experiences and to establish some sort of emptiness as a goal, then one has fallen into the extreme mental supposition that reifies emptiness. The transcendence or transmutation of both extreme suppositions is called “the Middle Way,” bU-ma in Tibetan, Madhaymaka in Sanskrit. One needs to know that the nature of all things (which is the same, whether one categorizes it as their emptiness and therefore they are fit to appear, or whether one categorizes it as their dependence and therefore they are empty of inherent existence) is all-pervasive, has always been present, and is not created or established. There is consequently no need to bring any appearance or experience to cessation. The purpose of understanding the indivisibility of the two truths or the twofold realities is to realize that all things that appear and are categorized as conventional realities or conventional truths are in their own nature without a self-established entity, i.e., without inherent existence. This is the ultimate truth. Therefore, the two realities have always been integrated and are the two aspects of one and the same thing. So a correct understanding is the basis or ground to be known in this way. The path is described in the verse above, which states that it is “the two accumulations free from the extremes of superimposition and denial.” The two aspects of practice, which are knowledge and method, are what need to be accumulated. If one is missing, then a practitioner will fall into an extreme, as was explained in relation to the ground, i.e., the two mistaken beliefs in either eternalism or nihilism. The remedy for the belief in eternalism is the correct understanding of emptiness, and the remedy for the belief in nihilism is the correct understanding or application of the methods. So, the accumulation or integration of the two aspects of the path is the remedy for the two extreme views. If there is only the aspect of application of methods and no training in the knowledge of emptiness, then a practitioner will not understand the explanation of emptiness given in the Great Vehicle, the Mahayana, and will erroneously fixate upon this practice without experiencing emptiness. Through a one-sided practice of methods, fixations will increase, referred to by the term “spiritual materialism,” a type of practice that lacks knowledge or understanding of emptiness. This is called the extreme “of superimposition” in The Prayer. The other extreme view a practitioner can fall into, called “denial” in The Prayer, is only developing the aspect of knowledge – prajna in Sanskrit, shes-rab in Tibetan.Denial is characterized by such erroneous beliefs as discounting the validity of karma and thinking it is not necessary to accumulate wisdom or to remove obscurations. Traditionally, there are many explanations on the defect that is called “grasping at the antidote,” “grasping at the remedy,” or “being lost in the remedy,” which all mean to say that there is a misunderstanding of the nature of emptiness that leads a practitioner to ignore the aspect of skilful means. It is of utmost importance that both aspects of knowledge and method, i.e., skilful means, be understood and integrated correctly. It is especially important that the path be practiced in the context of the integration of the two accumulations – the accumulation of merit (which is subject to change) and the undefiled accumulation of wisdom (which is beyond change), i.e., the accumulation of merit with concepts and the accumulation of wisdom without concepts. Perseverance of these two aspects as an integrated whole on the path is what unconfused knowledge of the path means. Fruition is accomplished through the unmistaken recognition of the ground (which is the knowledge of the two truths) and the unmistaken engagement in the path (which is the integration of the two accumulations). Fruition is described as the achievement of these two aims and is a state in which one is beyond the extremes of conditioned existence and peace. The description “free from the extremes of existence and peace” means beyond the extreme of conditioned existence (which is existence in or as the three realms of samsara) and beyond extreme of peace (which is the peace of Hinayana nirvana). Having reached a state beyond the extreme of conditioned existence and having abandoned all that is to be abandoned (the obscurations, such as the mental afflictions, karma, and the obscurations impeding wisdom-awareness), one accomplishes the Dharmakaya, the excellent attainment that benefits oneself. The Dharmakaya is attained through correct realization of the abiding nature and is referred to as “the wisdom that cognises how things truly are,” i.e., the realization that nothing is self-established, that nothing exists as an inherent entity, that nothing has an own reality. 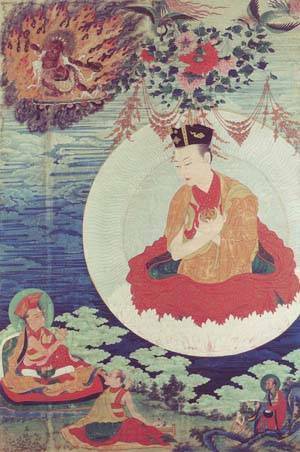 When the Dharmakaya has been attained through the relinquishment of all that is to be abandoned, another aspect of wisdom is realized, referred to as “the wisdom of the cognition of what there is,” i.e., the wisdom enabling an accomplished individual to perform supreme activities for the welfare of others. This wisdom is the basis for the manifestation of what is called the Rupakayas in Sanskrit, the “form bodies.” The Rupakayas are the manifestation of the aspect of mind’s lucidity and unimpeded nature, whereas the Dharmakaya is mind’s true nature, which is emptiness. In this way, the state of a Buddha is unlike the one-sided nirvana of a Pratyekabuddha or Shravaka in that there is complete relinquishment of all defilements and the ensuing twofold wisdom and manifestation of the Rupakayas. So fruition is explained to be the integration or union of the two Kayas. It can also be explained as the integration of the two wisdoms, the wisdom that knows how things are through the recognition of emptiness and the wisdom that knows how things appear in their manifestation. A quality of the second wisdom is knowing exactly how to train sentient beings accordingly and appropriately. This is how the ground, the path, and fruition are explained as the three integrations. In short: The ground is the integration of the two truths or realities; the path is the integration of the two accumulations; and fruition is the integration of the two Kayas or the two aspects of a Buddha’s wisdom. Knowledge of the ground, the path, and fruition is itself the basis for all understanding that one needs in order to practice Mahamudra correctly. Having heard these instructions, you have won the knowledge of hearing and receiving. Now you need to win the knowledge of contemplation by reflecting them. Summary: As mentioned earlier, when listening to the explanations of the Buddhadharma, it is essential to have a perfect or completely pure mind. I explained the nature of the ground, path, and fruition of Mahamudra. In summary: The ground is the integration or union of the knowledge of the two truths or two realities: the relative truth of how things are and the ultimate truth of the way things appear. The path is the integration of the two accumulations of merit and wisdom. And fruition is the achievement of the two aims: the excellent achievement of one’s own benefit through the attainment of the Dharmakaya and the abundant attainment of the benefit of others through the form bodies or Rupakayas. So, the integration of the indivisibility of the Kayas is fruition. The correct understanding of the ground, path, and fruition is the unmistaken knowledge of these three integrations. The difference between samsara and nirvana is whether confusion is present or not, specifically, whether or not there is the failure to recognize the ultimate nature. What obscures realization of the ultimate nature while in a state of confusion are the obscurations of karma and kleshas, “mental afflictions.” They need to be purified. In order to affect the purification, a practitioner needs to correctly understand the base for purification, what purifies, what is to be purified, the methods for doing so, and the result. This verse identifies them in sequence. First it is said that the base to be purified is the mind itself, which is the indivisibility of clarity and emptiness. This means that the mind is the base for purification and is not itself something that requires purification or needs to be changed in any way. The mind’s nature is free of arising, abiding, and ceasing. Having the nature of emptiness, mind itself is beyond what is to be purified. Obscurations arise due to the presence of the false apprehension of subject and objects, described earlier. Dividing apprehensions and enforcing them by being attached to or rejecting things gives rise to the habits that perpetuate dualistic modes of thinking and acting. In order to become free of duality, disciples need to engage in the preliminary practices of Ngön-dro, followed by the practices of tranquillity and insight meditation. Having done these practices, the Lama points out the true nature of the mind (also called “ordinary mind”) to a worthy disciple, who then begins meditating Mahamudra. Fruition means having purified obscurations completely and having spontaneous realization of the immaculate Dharmakaya, i.e., one’s pure Buddha nature that is one’s own mind. 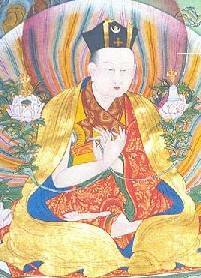 In the above verse, Rangjung Dorje taught that the mind itself is without any corruption. It is only obscured by the adventitious stains, principally the habitual imprints that need to be removed. This is accomplished by exchanging unwholesome habits with wholesome habits that serve as antidotes. At fruition, all habits are relinquished and liberation from conditionality is then accomplished. It is important to begin practicing by understanding the view, i.e., one needs to correctly identify the ground. If one does not correctly understand the ground, one will not understand fruition, which is manifestation of the ground. One will not really understand what is meant by the term “Buddha” either. Without appreciation and respect for the Buddha, it will merely be another word in one’s vocabulary. Without understanding the ground, a follower will not really know what practice involves. So, one must begin with a correct understanding of the ground. Having correctly understood the ground after having removed all misconceptions about the view, a devotee engages in meditation practice, which consists of non-distracted, concentrative even-placement on the view, i.e., on what has been correctly understood. Correct conduct means remaining in non-distractive wisdom-awareness during all activities, whether one is seated, walking about, eating, and so forth. Whatever one is doing, one upholds concentrated wisdom-awareness and lives one’s life in accordance with what is called “conduct supreme.” Should someone think they are practicing Mahamudra without the correct application of the threefold format, then they are not meditating Mahamudra and cannot attain liberation. means correctly realizing the view, correctly practicing meditation, and acting correctly during all walks of life. “All phenomena are mind’s magical play. As for mind, there is no mind! Mind is empty of essence. If one hopes to cut through misconceptions about the base, it is first necessary to know that all things making up conventional reality and that are experienced are the manifestation of the mind of the one who experiences, explained in the first line of this verse. 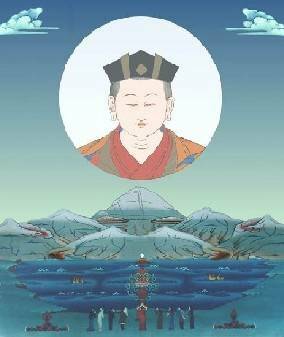 Rangjung Dorje continued and said that the experiencing mind is not a self-existing entity, because it is devoid of inherent existence, i.e., it is empty of essence. The third line states that while the mind is the source of what is experienced because it is empty, everything experienced is empty, too. Nevertheless, things arise in various ways. This shows that the emptiness of all things and their ability to arise are not contradictory since both are aspects of interdependence. Again, because things are interdependent, they are empty and because things are empty, they can arise. The first three lines in the verse above indicate the gradual process of correctly ascertaining the nature of the base. The fourth line is the aspiration that all living beings be able to cut through their misconceptions about the ground by correctly examining the essence. One does this by means of thorough examination and thus wins correct knowledge within the scope of a correct approach to the examination. This verse discusses the main points of the view. The next step is to examine each point step-by-step and in more detail. The first point that needs to be understood in order to practice Mahamudra correctly is that the confusion one experiences in samsara is based upon one’s dualistic apprehension. Duality means holding the objects that one apprehends to be true existents and dividing them into cognised objects in opposition to a cognising consciousness. The Tibetan term snang-wa has two connotations, one is “appearance” and the other is “projection.” Duality means not understanding that what appears is simply the coming together of various causes and conditions, the truth of interdependence or the relative truth. One thinks that what is perceived is outside oneself and clings to the cognising consciousness and to appearances as separate, at which point one divides one’s experiences into two aspects: subject and object. The first line teaches that one mistakenly perceives a self-existence of appearances upon having perceived them. It deals with the fact that everything one experiences is simply the coming together of many things. Appearances do not inherently exist from their own side or in their own essence. What happens is the following: When one perceives something, one designates or imputes an inherent existent due to one’s sensation. One might think, “This table, that bowl,” and so on. When one experiences a sensation after having perceived an object, one thinks it is real and separate from oneself. Then one labels it, which is a mere imputation of an object one has perceived and apprehended with one’s mind. The objects one experiences have no reality or essence of their own, even though one falsely apprehends them that way. This is what is meant when it is taught that everything is a projection or appearance of or for one’s own mind. Ultimately, things cannot be said to exist. A clarification needs to be made here. What is meant when it is said that everything is one’s own projection? This teaching admits a different interpretation. Some people hear this and think it means that there is nothing there at all and that everything is just a hallucination of the one who experiences. This is not the meaning. Rather, clinging to things as inherent existents is what is meant in this verse. For example, we think that our right hand is our right hand and that our left hand is our left hand. Ultimately, there is no such thing as left and right, because both assertions are imputed onto the perceived objects and are only valid with respect to their relationship to one another. Concepts define the relative nature of things. In the same way, one uses concepts in order to describe a reality to what one falsely clings to as real. Without being aware of this process, one is actually only imputing a supposed entity upon an appearance that in itself merely reveals relative reality. If one were to say, “This is my right hand” while pointing to the left hand, it would be as though one were mad; there is no doubt about that. One can also not say, “This is not a right hand” when it is a right hand in its relationship to the left hand. Yet, one cannot assert through any reasoning or by resorting to scriptures that one’s right hand is in its essence or nature one’s right hand. It is only due to its relationship to the left hand that it is a right hand, and vice versa. What happens is that one labels things according to their relative nature, then takes these labels to be real, and claims that the objects one has apprehended and designated exist of their own accord. One takes aspects of relative appearances, isolates them, and calls those aspects “independent existents.” This is what is projected by the mind. All things one apprehends are experienced in this manner, but things are nothing but the coming together of many causes and conditions. In that sense, everything is relative. It is important for practitioners to understand the way one usually perceives conventional reality and the way those practitioners who are referred to as “superiors” perceive ultimate reality. Superior individuals, such as Bodhisattvas, see that things do not exist ultimately other than as relative phenomena and, this being the case, are fit to arise in relationship with other things. Because things only arise in a dependent relationship with other things, nothing is an inherent existent. The correct understanding of the nature of things is the unconfused recognition of these two aspects as a unity and the lack of contradiction between appearances and their essential emptiness. This is what is meant when it is said that things are a projection of one’s own mind. It’s not saying that objects of experience are a hallucination and there is absolutely nothing there when there is. The first line of the verse above, “Our own projections, never existent, we mistake to be objects” clarifies this fact. The second line of the same verse, “Out of ignorance we mistake self-awareness to be self” means that as long as one fails to recognize the nature of a perception (which every living being has), one fixates upon it and calls it “self.” As a result, one experiences appearances as external existents, separates them from the self one perceived, and believes that they, too, exist of their own accord. In the third line, Rangjung Dorje speaks of, “Clinging to this duality,” which means that due to clinging to the mistaken belief that what is a projection of one’s own mind is external, separate, and inherently exists and the awareness or cognition that one possesses is a self, one takes subject and object to be separate. Beings come to wander in samsara as a result of clinging to the duality of believing self and other are real. This clinging is based upon ignorance – ignorance is the initial mistake. Due to ignorance as to the truth of the way things are and the way things appear, emotions arise and as a result one performs afflicted actions and creates one’s own karma. Then one necessarily proceeds to experience what is called “the twelve links of interdependent origination” – the active workings of karma that is compared to a water-wheel. The fourth line is an aspiration prayer: “May we cut through ignorance and confusion at the root.” This line addresses the fact that suffering arises through the entire process that evolves due to not recognizing or understanding the actual manner of the abiding base. So one aspires to cut through the root of this confusion by gaining a correct understanding of the base when one contemplates this line. Of the two principal aspects of the view, which were mentioned as being the recognition that what one experiences is a projection of one’s own mind and establishing that one’s mind is not inherently existent in itself, we have dealt with the first. In revealing or establishing the ground, there are three points: The first is understanding that all phenomena are projections of one’s own mind. The second is knowing that one’s mind is without inherent existence or in essence is empty. And third, realizing that the conventional presence of all appearances and their ultimate reality are not contradictory but in truth are two aspects of the same thing. Of these three points, the first has been explained. Now I will speak about the second essential point. We have a body and mind while we are alive. Our body is composed of many substances, and these substances also consist of other substances and particles. What one calls “my mind” is one’s awareness or cognition, which somehow seems to be based upon one’s body. When one thinks of oneself, one usually thinks of oneself as a combination of these two elements. Although they cannot find it, some people think that the mind is the heart, others think it is the brain, while others say it exists somewhere inside the body. Some people think that when the body is destroyed, the mind is also destroyed. But the mind is not physical. If it were, it would be composed of particles and could be touched or seen. The mind cannot be hindered in any way, e.g., one can think of far-away places, even if one cannot be there in person. One can think of anything one wishes to think about, because the mind is not obstructed like the physical body, which cannot go places as freely as the mind. What is the mind then? Immaterial cognition that is not impeded by matter. Furthermore, if the mind consisted of matter, it would have a colour, a shape, a size, and would exist in a specific location. This has to be examined. If the mind was the body and a limb was amputated in surgery, parts of one’s mind would then also be removed, but this does not happen. Certainly, surgery and any sickness affect one’s mind, but it doesn’t change the nature of one’s mind. Also, should the mind be solid and real, then the Buddhas would be able to see it, but they haven’t seen it. Through this discussion, we understand that it is impossible to prove that the mind is an entity that exists, but we also understand that it is impossible to prove that it doesn’t exist. Mind is not a compounded entity consisting of matter one can detect; yet it would be wrong to say that it doesn’t exist, because it is the mind that undergoes confusion in samsara and it is the mind that experiences liberation in nirvana. The only basis one has when differentiating samsara from nirvana is whether or not the mind recognizes its own nature or not. Aside from that, samsara and nirvana only exist in the presence or absence of realization. By failing to recognize one’s mind’s true nature, one creates duality and samsara abounds. Through recognizing one’s mind’s true nature, one is liberated and nirvana abounds. The third line in the above verse speaks about the path of the Great Middle Way, which leads followers to be free of the four extreme views that 1) the mind exists, 2) that the mind can be said not to exist, 3) that it both exists and doesn’t exist, and 4) that it neither exists nor doesn’t exist. This means that mind’s essence is the indivisibility of emptiness and clarity. When one hears about non-existence, one usually thinks of the non-existence of something. The next line teaches that non-existence in this context does not refer to a non-existent thing, so there seems to be a contradiction, but there isn’t. The mind’s essence is free of any extremes and is ineffable, which is precisely described in Madhyamaka, the “ Great Middle Way” – it is the indivisibility of emptiness and clarity. If one thinks about it, it is not a matter of finding something that exists or of trying to realize something that doesn’t exist. Thinking one will discover that mind doesn’t exist restricts one’s appreciation that mind manifests beneficial qualities of being, which are the mind’s clear aspect. This has been a short presentation why mind cannot be said to exist or not exist. The second point asks whether the mind is not something or not not something. In this way, the inherent existence of both what is experienced as apparent, external objects and what is experienced as the apprehending cognition have been shown to be empty or devoid of inherent existence. When one realizes simply this, there is no other enlightenment. This verse deals with the significance of realizing the true nature of all things. The first line indicates that by failing to realize the nature of the mind and of phenomena, one apprehends external objects and an apprehending consciousness falsely, taking both to truly exist. As a result, one separates and divides, which is confusion, i.e., confusion is the absence of realization that the true nature of all things is the indivisibility of clarity and emptiness. The second line points to the fact that there is nothing else that needs to be realized than “simply this.” Buddhahood is not beyond or other than realization of non-duality. The third line indicates that it is only necessary to know whether one recognizes the true nature of all things or not. It is impossible to actually find what is pure and what is confusion that needs to be overcome, seeing that confusion is mind’s habit of dividing things into this and that. The ultimate nature is all-pervasive and consequently is the ultimate nature of all things. The fourth line is the aspiration that “we realize essential reality, the underlying nature of the ground of all,” which is the base – the Buddha nature. Many different practices are taught in the Three Vehicles of Buddhism and they are all designed to benefit oneself and others, in one way or another. Although there are many practices relating to body and speech, such as the observance of discipline, all are directed towards training one’s mind. The main point in all practices is cultivating mindfulness and awareness. If one feels that one has not benefited through practice, then it is impossible to realize the true nature. In this way, all teachings imparted by Lord Buddha are in agreement and have the same aim, to help beings tame and train their mind. The foregoing was an explanation of the view of Mahamudra. Now follows an explanation of the meditation practices based on the view. The next section in The Aspiration Prayer for Mahamudra is extremely important, because it instructs devotees in Mahamudra practice. The first line in this verse tells us that meditation is not corrupted by intellectual pursuits, rather that Mahamudra practice means resting evenly in the uncontrived essence of one’s own mind. Any attempt to alter one’s true nature or to create a new mentality is not Mahamudra. When a disciple begins practicing shamata, “calm abiding meditation,” he and she need to know the technique and be informed of the direction to follow. But the actual practice doesn’t lead in any direction but frees one from mental contrivances that distract and disturb one’s mind. Therefore it is necessary to begin with shamata. The second line points to the fact that practicing Mahamudra means not being distracted; the third line confirms that one can actually practice not being distracted. Traditionally, Mahamudra is explained as not grasping at or following after a thought that arises concerning the past, not inviting or bringing on thoughts with regard to the future, and not conceptualising the nature of what arises on the mind’s nature in the present moment. Familiarization with this practice is referred to as “even-placement” and is the manner of engaging in the practice of shamata. The great Mahasiddha Saraha taught that one needs to remain in even-placement with regard to the three times, i.e., not to be distracted when thoughts concerning the past, present, and future arise. One should not be separated from even-placement at any time, which does mean to say that one should not be perky. The point is becoming accustomed to placing the mind in its own nature. When this is achieved, it is called “Mahamudra.” Actually, there is no such thing as a meditator and a meditation practice other than training the mind to abide in its own nature. Again, Mahamudra is not an intellectual matter, rather it is allowing the mind to rest evenly in its own nature. The placid river of mind gently comes to rest. Shamata is the Sanskrit term that was translated into Tibetan as zhi-gnäs. The first syllable zhi means “pacification,” gnäs means “to abide,” “to dwell,” so zhi-gnäs means “to dwell in peace.” This verse says that “coarse and subtle thoughts” dissolve “in their own place,” which is the first result of zhi-gnäs practice. The description that the “placid river of mind gently comes to rest” describes the second result of zhi-gnäs practice, in which case the mind’s continuum unwaveringly comes to abide in itself. Subtle conceptuality in this context refers to the examination of what was perceived. When coarse and subtle thoughts come together, one is overwhelmed by the apprehension. Both coarse and subtle conceptuality have to be pacified, which is meant by the term zhi, “pacification.” Rangjung Dorje offered the simile of a placid river coming to rest when “the waves of coarse and subtle thoughts” dissolve “in their own place,” which is meant by the term gnäs. The most important aspect of tranquillity meditation is gnäs, which is defined as rang-sar-zhi in Tibetan. In practicing Mahamudra, one does not try to block off thoughts or bring them to cessation, rather one allows them to become naturally pacified without applying a technique that involves another thought. In fact, one does not only not seek to block off thoughts through meditation, but one recognizes their nature the moment they arise, since they are the natural radiance or pure expression of one’s mind, just like waves on the surface of the ocean are not foreign to the ocean itself. When thoughts arise during shamata or Mahamudra meditation, it is important that one does not follow after them, that one does not allow oneself to become distracted by them, and that one does not try to block them. If thoughts are recognized at face value, i.e., as thoughts the moment they arise, then liberation is simultaneous and occurs naturally. Having developed zhi-gnäs, a devotee proceeds to generate the wisdom of special insight, vipassana in Sanskrit, lhag-mthong in Tibetan, which means “full discernment of all dharmas.” Shantideva said that through special insight in conjunction with perfect tranquillity attained through shamata practice, mental afflictions are overcome. The reason one cannot recognize one’s mind is because one is distracted, so one needs to allow one’s mind to rest in its own nature. In order to accomplish this, one has to dispel the two defects that can arise during shamata. They are dullness and excitement. The way to dispel them is by practicing shamata and vipassana together. First one needs to have perfected shamata, though, before one engages in vipassana. When both are then practiced together, the two defects will be overcome. As said, practice means one doesn’t attempt to block or bring thoughts to cessation, rather one looks at their essence the moment they arise. By seeing the essence of thoughts and the essence of dullness and excitement, one lets go and transcends them by realizing that they are empty. This is only possible if one practices tranquillity and insight meditation together. There are two types of zhi-gnäs practices: mundane and supramundane, i.e., meditation with a support and meditation without a support. Mahamudra zhi-gnäs is called “ultimate practice of tranquillity,” in which case one looks at one’s mind’s essence, doesn’t follow after thoughts that arise, but rests in evenness. Different experiences arise while practicing zhi-gnäs. The first is said to be like a waterfall in that one experiences many thoughts that seem like a great torrent of water flowing over the edge of a cliff. The second experience resembles a flowing river, so the current is not quite as strong. Many thoughts occur during this stage, but one doesn’t follow after them as before and therefore has more control. The third experience resembles a calm ocean that is steadfast and unperturbed, i.e., one’s mind is just as steady and calm and one has fully brought it under control. Based upon this practice, one continues by engaging in lhag-mthong meditation. Unseeable reality is seen vividly, just as it is. “Looking at objects – there are no objects, they are seen to be mind. Looking at mind – there is no mind, it is empty of essence. Should an individual realize wisdom of lhag-mthong, then he or she will not fabricate dualism with regard to the one who experiences and experiences, rather sees that all objects of perception are not beyond mind’s true nature, i.e., the nature of all apprehensions is not other than the own mind. This doesn’t mean to say that one sees one’s mind in an object of perception, rather one sees that the essential nature of all phenomena is empty of inherent existence, just like one’s own mind. Mind is the inseparability of emptiness and lucidity; therefore the nature of all things is not other than one’s own mind. It is very important to appreciate and recognize that this is what Rangjung Dorje meant when he composed the four short lines in this verse. One should not think that they mean something else. In the third line the Gyalwa Karmapa taught us that by looking at both aspects of the mind – emptiness and clarity – then “clinging to duality is self-liberated,” i.e., everything is liberated into its own place and one realizes that for which one aspired. The first line tells us that Mahamudra means being free of all mental fabrications or directedness that one usually has by thinking that some things are good and other things are bad, and so forth. The second line describes realization according to Madhyamaka and refers to that aspect of the mind that is free of the four extreme views (believing appearances and experiences exist, do not exist, both exist and do not exist, or neither nor) and the eight mental suppositions about reality (believing the true nature has such attributes as arising and ceasing, being singular or multiple, coming and going, being the same or being different). The third line describes realization of Dzogchen, the “Great Completeness,” which contains within itself the nature of all things in samsara and nirvana. The fourth line then states that although there are different names, called “the three greats,” these terms are only used in order to describe different aspects of realization. They describe realization and mean to say that there is nothing else to realize than just that. Noble Rangjung Dorje saw that some people evaluate one aspect as more profound than another. Some practitioners think Mahamudra is higher than Dzogchen, while others insist that Mahdyamaka is more profound. Seen from fruition, all are the same. The only difference one can make is from a conventional understanding, whereas intellectual formulations can never describe the ultimate nature. All three terms – Mahamudra, Madhyamaka, and Dzogchen - are synonyms. As to the path, there are also no distinctions. However, when applying the path, distinctions are made according to practitioners’ varying inclinations and differing abilities and needs. In the first line Most Excellent Rangjung Dorje explains the experience of bliss. The essential point here is that an experience of bliss arises for which no grasping, attachment, or craving is present. A distinction needs to be made, though, between ordinary happiness and bliss, which one usually craves and becomes attached to. Ultimate bliss, in contrast, is free of attachment and never ends. The second line explains the experience of clarity and states that it is unobscured luminosity that is free of clinging to any characteristics. In this case, a successful practitioner does not perceive the manifestations of clarity as real nor grasps at the forms that clarity brings forth; in other words, there is no experience in the mind of an apprehending experiencer and apprehended experiences, i.e., subject and objects. Instead, mind’s natural clarity is directly perceived and there is no clinging to its characteristics. The third line explains the experience of non-conceptuality that is spontaneously present when the conceptual mind has been transcended and rnam-par-mi-rtog-pa’i-ye-shes, “the wisdom of perfect non-conceptuality,” has been attained. If one fixates on any of the three experiences, they become the cause for rebirth in one of the three realms of samsara. Fixation on bliss causes rebirth as a god in the desire realm, on clarity as a god in the form realm, and on non-conceptuality as a god in the formless realm. If there is freedom from fixation on these experiences, then they lead to ultimate realization – the unimpaired state of omniscience. When teachers offer practical advice concerning experiences that arise for students practicing the path of meditation, the teacher will always respond, “Do not be attached to them. Do not fixate on them.” Therefore, the verse above describes the various experiences that students have while on the path. By practicing correctly and not becoming attached and not clinging to experiences of bliss, clarity, and nonconceptuality, an advanced practitioner gradually accomplishes fruition, which is Buddhahood. Yet not realizing this, they wander endlessly in samsara. And as it does, its emptiness of essence nakedly shines. And prayers to attain the Buddha’s qualities are fulfilled. I have explained Mahamudra, will therefore not go into details about the verses of aspiration, and rather want to ask you to remember that by knowing the ground and having the correct view, the path and fruition will naturally evolve. A practitioner proceeds by contemplating and meditating the view and then engages in correct conduct. Please know that Mahamudra is not just something one speaks about and is not something that can be easily understood intellectually. In order to practice and realize Mahamudra, it is utterly necessary to engage in the various stages of training, which are the stages of accumulating merit and wisdom, of purifying one’s obscurations, and of actually receiving the transmission of the wisdom of Mahamudra and the special instructions personally from one’s teacher. Question: Rinpoche, I have two questions. One concerns the terminology. Saying in English “mind abides” or “the abiding nature of mind” doesn’t make much sense to me. What does that refer to? His Eminence : The term has been translated as “manner of abiding” or “nature” and means the way something is without alteration. Same student: My second question concerns prajna or shes-rab. When talking about denial, you said that denial was due to only developing prajna and this could lead to a misapprehension of the nature of emptiness. But, the way I have understood it is that prajna apprehends the nature of emptiness. Rinpoche: In general, the term “prajna” refers to a specific wisdom that realizes emptiness. The term is used in many different ways. There are what are called “worldly” and “supramundane knowledge,” and so forth. Relating to the path, the actual training on the path is divided into the aspects of the cultivation of superior knowledge and the cultivation of methods. It is not necessarily the case that the aspect of knowledge or prajna being cultivated at the time of the path is the prajna that is the actual realization of emptiness. It is the aspect of the path that is concerned with the realization of emptiness and therefore the cultivation of only that and the ignoring of its other necessary component, the aspect of method, which can lead to misconceptions with regard to emptiness, such as the belief that emptiness is a total negation and that there is nothing whatsoever. Same student: Could that be related to what Thrungpa Rinpoche called “shunyata poisoning” or is that something else? Next question: Your Eminence, you said that the basis for the Dharmakaya is wisdom, which was translated as “a wisdom that cognises how things are” and that the basis for the Rupakayas was “the wisdom that cognises what is.” One has heard of a system or an understanding of five or six wisdoms. I would like to ask if the two wisdoms that are a basis for the Dharmakaya and Rupakayas are a shorthand for the five or six wisdoms, whether one of those represent three of the six wisdoms, and the wisdom of the Rukapayas the other three, or is it erroneous to try to understand things in that way? Rinpoche: The two wisdoms, the wisdom or understanding of how things are and the wisdom that is the knowledge of the variety of what there is, are different aspects of the wisdom of a Buddha. The wisdom that is the knowledge of how things are is the aspect of profundity. In this context, profundity means recognizing the essential emptiness of everything. The aspect of wisdom that is the knowledge of what there is, or the variety of what there is, is the aspect of vastness or extensiveness of the wisdom of a Buddha. This is the understanding that in dependence on the fact that things have no established nature, they are free to arise in the variety of ways in which they arise in dependence on each other. Therefore, these two wisdoms are actually not different from each other. They are explained separately for the sake of a correct appreciation, but they are actually aspects of a Buddha’s wisdom. It is like talking about the ocean. You could say it is either deep or very vast. You could say both things in an explanation of it, talking about the same ocean. In the same way, the two wisdoms are the aspects of recognition of emptiness and lucidity. Just as emptiness and lucidity are the same from different points of view (which is what saying that they are integrated means), these are also distinguished simply for the sake of correct understanding. Now, this wisdom possesses these two characteristics of knowing, which is the essential wisdom of any Buddha. In the context of Mantrayana, it can be divided into different characteristics, into five, six, or one hundred, and so on. Next question: Can you explain the process through which devotion to the Guru helps the practitioner remove ignorance and confusion? Rinpoche: The best kind of devotion is called “uncontrived devotion.” If a practitioner has this, then the blessing or inspiration of his or her Guru and the Guru’s lineage will enter into his or her mind or heart. As a result, the actual recognition of the nature of the mind will occur spontaneously, i.e., without the need to attempt to manufacture it through the means of mental contrivances. But, devotion needs to be combined with practice and effort on the side of the disciple. Since devotion has such power, it is emphasized and said to be very important. Next question: Trying to understand the view of how there is mind that has distinct nature rather than solidity, as if we had a big stew and not all is mushed together, there is still a distinctive potato, carrot, or onion. Things have their own difference and aren’t solid or permanent. Do you understand my question? Rinpoche: Yes, I do. Are you referring to the distinction of appearances or those within the own mind? Student: Between mind. There’s a big difference between our mind and your mind. Rinpoche: Distinctions occur due to not recognizing the actual nature of the manner of abiding of the mind. On the basis of that, there is the false apprehension of things as dual – of self and other. If the nature is recognized, for example, by Buddhas or Bodhisattvas, they have the ability to actually introduce the inspiration of their compassion directly to the minds of others. The reason they can do this is because they have recognized non-duality. For example, there was a question on how devotion functions as a medium for Mahamudra. As I said, what is transmitted is not just words but something greater than words. One may ask, “How does that happen? How does that transmission or identification occur?” It comes about through the link of the student on the basis of his or her faith and devotion, faith in and devotion for the Lama and for his attainment and realization. The Lama’s realization of non-duality of the nature is another example of how this functions. Next question: In the process of shamata, one comes back to the breath. If we do Mahamudra practice, is that a result of doing shamata? Rinpoche: There is a distinction between shamata and Mahamudra practice, but within Mahamudra, there is also shamata and vipassana. Same student: So, if you are practicing Mahamudra, what do you come back to? If you are off with distractions, do you come back to space, to being? Rinpoche: You come back to resting the mind evenly in its own essence. Next question: You talked about purification, the preliminaries, shamata and vipassana, and Mahamdura. Why is it that the Lama doesn’t introduce us to the nature of our mind on the spot? Rinpoche: The reason for the sequence of practices done is as follows. The preliminary practices go before, which is why they are called Ngön-dro, meaning “going before.” If the Lama were to point out or introduce the basis or ordinary cognition in the very beginning, we wouldn’t recognize it, we wouldn’t be able to receive it. The reason we do not see it anyway is that since beginningless time we have accumulated obscurations, such as afflicted actions and so forth. These have to be removed. The most efficacious method to remove these is through the practices presented in Ngön-dro. On the basis of the preliminaries, there are also practices of accumulating merit and wisdom. Finally, through Guru-Yoga practice, we generate devotion for our Root Guru. Then the introduction or identification can take place. But first there needs to be the attainment of mental stability through the practice of shamata. If that is not present, one will again not be able to recognize what one’s Lama is pointing out. However, having engaged in those practices, then the Lama can point out what is called “the wisdom that is insight.” Having undergone the process of practice, one will be able to recognize what the Lama introduces. Next question : What is the difference between samsara and nirvana? What practices are not good for the mind and do not lead to realization? What is this realization? Which disciplines do not lead to realization? Next question : I have two questions. The first, is there an element of Mahamudra in Ngön-dro where one rests one’s mind in its natural state? Secondly, would you talk about the Guru-disciple relationship and receiving teachings from many other Lamas than one’s Root Guru? What do pupils do if their teacher has passed away? Rinpoche: In the completion of every part of the preliminaries, there is what is called “the withdrawal” or “the dissolution phase.” Following that, it is appropriate to engage in the practice of Mahamudra to the best of one’s ability. Particularly, this is true with respect to Guru-Yoga practice, which ends with the withdrawal phase, after which the body, speech, and mind of the Root Guru melts into one’s being and one rests in that inseparability. 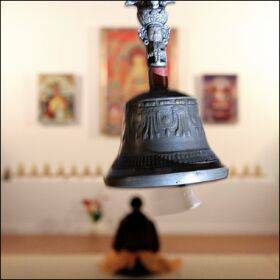 Within this state, it is especially appropriate to engage in Mahamudra practice. Regarding the Guru-disciple relationship, it is not a matter of whether the Guru is physically far away. The important point is to receive the teachings of Lord Buddha and to integrate them in one’s life. Seeing one’s Guru twice a year would be fine. Rinpoche: This is a personal matter and depends upon a student’s attitude. Someone could see a teacher a few times and just blaze with devotion, which is a very unsuitable approach. General statements cannot be given, however, it is necessary to carefully check and examine the situation so that one’s faith is stable. Next question: Is the path of seeing the path of unification? Next question: You spoke about coarse and subtle perception, referring to the dualistic apprehension of subject and object. When we tread the path, does the subtle level of perception change so that we have no more fixations on subject and objects, while the general way of perceiving depends upon the extent of one’s realizations? Rinpoche: Different stages can be distinguished while progressing on the path. Ultimately, both coarse and subtle conceptualisations will be liberated. Coarse conceptuality refers to the application of the consciousness to an object. Subtle refers to examination or consideration of the concept of the perception that has arisen from the initial contact. So, coarse conceptualisation refers to the experience of contact and subtle conceptualisation refers to an examination of that experience. Next question: Your Eminence, when one is not accustomed to the experience of insight, when one is sitting in meditation and has what one believes to be such a glimpse of this experience, two thoughts may arise. The first is that one may be overwhelmed by such an experience. My first question is, what is the proper practice to apply if one feels overwhelmed by what one believes to be a glimpse of insight? Secondly, if one is able to continue to meditate this way, it may come to pass that the problem arises that one wishes to continue meditating while one has obligations to fulfil in everyday life. How does one avoid leaving that experience aside in the process of finishing the meditation session and then going out to fulfil one’s obligations? Rinpoche: Has this actually happened to you or is this a theoretical possibility you are considering? Same student: I believe I have had the experience. Rinpoche: When such an experience arises, you should consult your personal teacher and you should not think too much about it or think about different things you could do about the experience. Especially, if an experience arises that has not been explained to you or for which you have not been prepared through the guidance of your teacher, then you should just let it go. Next question: How does one become a disciple? Rinpoche: There isn’t a particular formal procedure or ritual for becoming a disciple or student of a particular teacher. Once you have received teachings from a teacher, you are his or her student. As I said before, if you wish to become a personal disciple of a specific teacher, it is important to examine the situation carefully before doing so. A distinction can be made with regard to the type of relationship one has. In general, when talking about a spiritual friend, the relationship is simply one of receiving instructions. In the case of entering into a particular Guru-disciple relationship and assuming a teacher as one’s Root Guru, one should first examine the teacher and the situation carefully. One needs to make sure that one wishes to enter into this bond and isn’t following a sudden whim. One’s wish and motivation must be stable. If you are sure of this, then you should present yourself to the teacher and request his or her permission to be a disciple. If it’s okay, the teacher will say so. Next question: I understand the way things are. Why do you say ultimate realization? Rinpoche: The reason the ultimate is called so is because it is the realization of the way things ultimately are and is a direct experience. Realization itself is of the ultimate nature and doesn’t resemble an examination carried out using logical reasoning. For example, the Buddha explained the details of the state of realizing things as they are. He did not invent them as a type of experience that people may have, rather he described the actual experience of what there is, and therefore it is said to be ultimate. Rinpoche: Why does it surprise you? Same student: As to its ultimacy. Rinpoche: Who is without doubt as to this? Student: Obviously whatever is experiencing without doubt. Rinpoche: Realization of the ultimate nature is said to be realization of the ultimate nature because it is not based upon and doesn’t come about from the adoption of a theory or an understanding won through valid reasoning. It is a direct experience of what actually is the ultimate - the way things are just as they are. This is taught from the point of view of fruition. From an explanation according to the path, logical reasons establish that things are the way they are. The teachings are presented according to the format of ground, path, and fruition. It is up to a student to believe this or not and to have trust and confidence in the teachings. Next question: How do you explain the experiences of meditation that “I am light,” “I am illumination,” “I am clarity,” or “I am concept”? Why is this allowed to be experienced? After just experiencing this, there is a call for action. In the presence of a person who is suffering, there is a call for action and they can say, “I command the healing or the alignment.” When people experience the different states that you described, how is the call for action to heal a call for action in a constructive sense? Why does this happen according to Rinpoche’s explanations? Concerning the experience of being called to engage in activity for the benefit of others, if one experiences one’s mind’s nature genuinely, which is the inseparability of emptiness and clarity, then one has unimpeded, spontaneous and great compassion, which drives one to benefit others. This is called “the awakened mind” or Bodhicitta. Next question: You spoke of these experiences and said that they are continuous. Can they be temporary for beginners? I have two questions. One way is to experience occasionally, as in the transmission from one’s teacher or in states of meditation. Does that put one in another path, in the path of seeing as opposed to the path of accumulation, or does a practitioner go back and forth along the path? Rinpoche: With regard to your first question, it is not the case that the experiences of bliss, clarity, and non-conceptuality will arise unimpeded for everyone in practice. Under certain circumstances, it is possible that they may if practice is at its best. Therefore, the aspiration is made that they do arise continuously. With regard to other experiences in traversing the five paths, the Dharmakaya is actually experienced when one enters the third path of seeing. At that point, one will never fall back on the other two paths, but must progress through the fourth path of meditation and the fifth path beyond training. However, a distinction must be made between seeing Dharmata and actually realizing it fully for the first time. There are many distinctions of seeing the meaning before the actual path of seeing has been attained. I taught that it is incorrect to translate the second path as “the path of unification,” because it means the application of the meaning of the path of accumulation to the wisdom of the path of seeing, so it should be translated as “the path of application.” On the path of application, there are four levels of experience, called “warmth or getting warm,” “peak,” “patience or forbearance,” and “the supreme Dharma in the world.” These are defined in accordance with the experiences that arise at the respective levels. Once the third level of the path of application is achieved, which is patience, there is no falling back into what is referred to as “the lower realms of existence.” In that way, there are distinctions concerning the actual experiences before one reaches the path of seeing. I compare it with recognizing somebody and knowing somebody. You can recognize someone without knowing him or her. This example illustrates the distinction between an initial experience and actual realization that is attained on the third path of seeing. 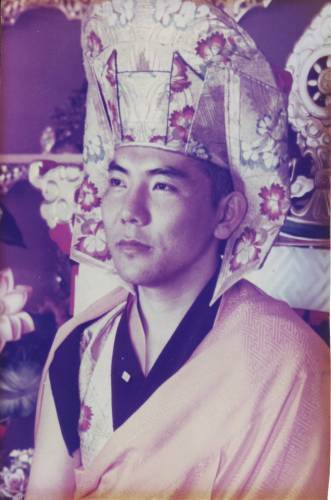 Translation of the root text under the guidance of Khenpo Tsultrim Gyamtso Rinpoche by Ari Goldfield (in May 1999 and revised in September 2001), available in the website of Nalandabodhi. His Eminence presented the instructions on The Aspiration Prayer for Mahamudra in Montreal, Canada in 1990. They were translated from Tibetan by Karma Yeshe Gyamtso, transcribed and edited for the website of Karma Lekshey Ling Institute and for the archives of Pullahari Monastery, both in Nepal, by Gaby Hollmann, responsible and apologizing for all mistakes. May virtue increase!